Today is the day that the deal between Vitesse and Maxim was finalized after many long months of uncertainty. Tuesday morning I will show up at work and I suppose begin signing papers to tranistion to being a Maxim employee. Several meetings are already scheduled so I suppose work will be a bit disrupted this week. Next week I’m on vacation to go elk hunting in the mountains. We leave on Saturday right after Paul’s final soccer game of the season. Today, the 21st of October is Luke’s 16th birthday. We went out to On The Border for an early dinner and Luke opened some presents when we got home. He was looking forward to getting snow on his birthday and got his wish. Paul got him a soccer ball, and Lisa and I got him a shirt, a hunting knife, a backpacking stove and a backpacking LED lantern. It is a big birthday, afterall. He hopes to have a good reason to use the hunting knife as we head out to go elk hunting in the high-country in two weeks and this is the first year he has an elk license. Well, we got our first snow late Saturday night which didn’t really stop until Sunday morning. It added up to about 5 inches. On Saturday, Paul played a soccer game up in Longmont and it was 80 degrees and I put on sunscreen and all that. Today the high was maybe 40! Brrrrrrr…. 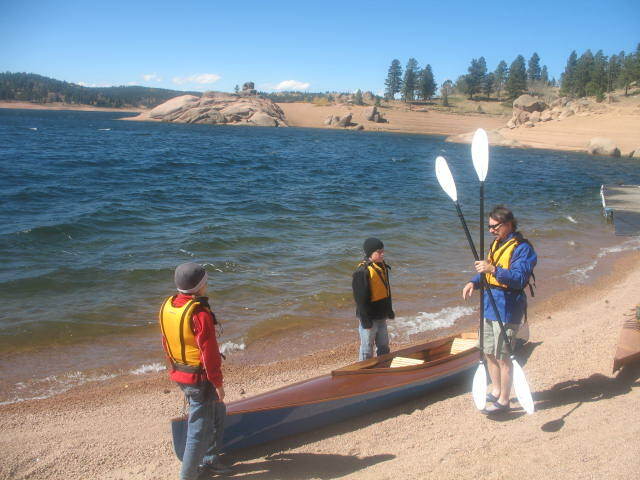 On Saturday we loaded up the sea kayak and the new Mill Creek 16.5 tandem kayak and headed up to Rampart reservoir. It was really windy and the waves were a bit rough at times. Lisa and Luke and Paul and his friend Robert all went along. 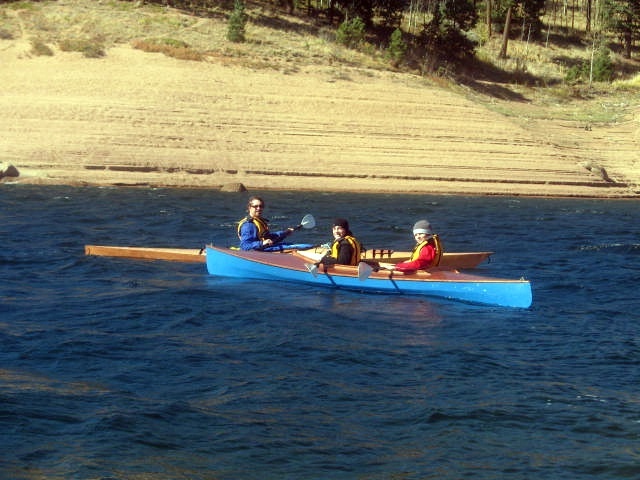 This new boat is significantly more stable than the sea kayak and if it was less windy, Lisa would have gone out for sure. Maybe next time. All I’ve got to do is install the seats and it’s ready to paddle. Just add water. It won’t be fully finished until I install some hatches, deck rigging, and some more coats of paint and varnish. But, we don’t need those to go fishing. Now we just need the weather to cooperate. Well, well . . . well. After much pain and gnashing of teeth with the primer, I put the first coat of paint on the Mill Creek hull tonight. Not too bad if I say so myself. We’re hoping to get it in the water this weekend, but we’re cutting it REALLY close. Another coat tomorrow and then the final one on Thursday night. Then a coat of varnish on Friday night and if it seems okay on Saturday morning we’ll head out. Otherwise, I’ll put on the remaining two coats of varnish on Saturday and Sunday and head out the following weekend. I can add additional coats at any time. It doesn’t do anything for the waterproofing of the craft, but does help protect the epoxy from the sun’s UV rays.